Network Intent Composition (NIC) is an interface that allows clients to express a desired state in an implementation-neutral form that will be enforced via modification of available resources under the control of the OpenDaylight system. This description is purposely abstract as an intent interface might encompass network services, virtual devices, storage, etc. The intent interface is meant to be a controller-agnostic interface so that “intents” are portable across implementations, such as OpenDaylight and ONOS. Thus an intent specification should not contain implementation or technology specifics. The intent specification will be implemented by decomposing the intent and augmenting it with implementation specifics that are driven by local implementation rules, policies, and/or settings. The core of the NIC architecture is the intent model, which specifies the details of the desired state. It is the responsibility of the NIC implementation transforms this desired state to the resources under the control of OpenDaylight. The component that transforms the intent to the implementation is typically referred to as a renderer. For the Boron release, multiple, simultaneous renderers will not be supported. Instead either the VTN or GBP renderer feature can be installed, but not both. For the Boron release, the only actions supported are “ALLOW” and “BLOCK”. The “ALLOW” action indicates that traffic can flow between the source and destination end points, while “BLOCK” prevents that flow; although it is possible that an given implementation may augment the available actions with additional actions. Besides transforming a desired state to an actual state it is the responsibility of a renderer to update the operational state tree for the NIC data model in OpenDaylight to reflect the intent which the renderer implemented. For the Boron release there is no default implementation of a renderer, thus without an additional module installed the NIC will not function. There is no additional administration of management capabilities related to the Network Intent Composition features. A user can interact with the Network Intent Composition (NIC) either through the RESTful interface using standard RESTCONF operations and syntax or via the Karaf console CLI. The Network Intent Composition (NIC) feature supports the following REST operations against the configuration data store. POST - creates a new instance of an intent in the configuration store, which will trigger the realization of that intent. An ID must be specified as part of this request as an attribute of the intent. GET - fetches a list of all configured intents or a specific configured intent. DELETE - removes a configured intent from the configuration store, which triggers the removal of the intent from the network. The Network Intent Composition (NIC) feature supports the following REST operations against the operational data store. GET - fetches a list of all operational intents or a specific operational intent. This feature provides karaf console CLI command to manipulate the intent data model. The CLI essentailly invokes the equivalent data operations. Adds an intent to the controller. Removes an intent from the controller. Lists all intents in the controller. Shows detailed information about an intent. List/Add/Delete current state from/to the mapping service. Examples: --list, -l [ENTER], to retrieve all keys. --add-key <key> [ENTER], to add a new key with empty contents. --del-key <key> [ENTER], to remove a key with it's values." to add a new key with some values (json format). List values associated with a particular key. Adds a new key to the mapping service. Specifies which value should be added/delete from the mapping service. Deletes a key from the mapping service. Start mininet, and create three switches (s1, s2, and s3) and four hosts (h1, h2, h3, and h4) in it. Replace <Controller IP> based on your environment. Unzip the downloaded zip distribution. Once the console is up, type as below to install feature. The section demonstrates allow or block packets of the traffic within a VTN Renderer, according to the specified flow conditions. Allow Permits the packet to be forwarded normally. Block Discards the packet preventing it from being forwarded. Before execute the follow steps, please, use default requirements. See section Default Requirements. To provision the network for the two hosts(h1 and h2) and demonstrates the action allow. To provision the network for the two hosts(h2 and h3) and demonstrates the action allow. As we have applied action type allow now ping should happen between hosts (h1 and h2) and (h2 and h3). To provision block action that indicates traffic is not allowed between h1 and h2. As we have applied action type block now ping should not happen between hosts (h1 and h2). Old actions and hosts are replaced by the new action and hosts. Respective intent and the traffics will be deleted. Deletion of intent and flow. To provision the network for the two hosts(h1 MAC address and h2 MAC address). The section explains the redirect action supported in NIC. The redirect functionality supports forwarding (to redirect) the traffic to a service configured in SFC before forwarding it to the destination. Configure the service in SFC using the SFC APIs. Configure the intent with redirect action and the service information where the traffic needs to be redirected. First flow entry between the source host connected node and the ingress node of the configured service. Second flow entry between the egress Node id the configured service and the ID and destination host connected host. 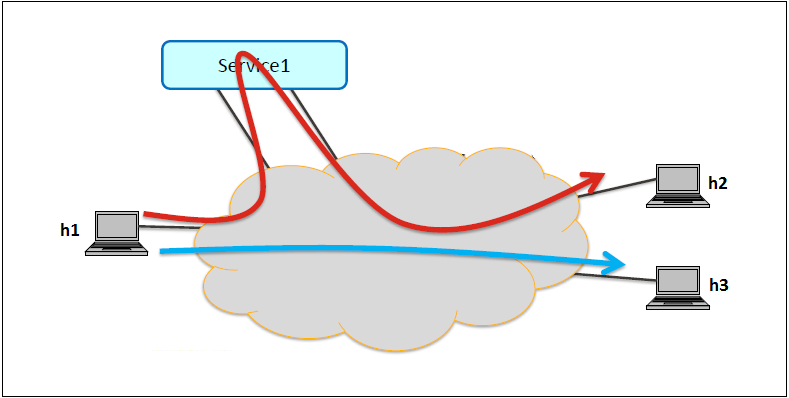 Third flow entry between the destination host node and the source host node. Start mininet, and create switches in it. Before execute the following steps, please, use the default requirements. See section Downloading and deploy Karaf distribution. Configure srvc1 as service node in the mininet environment. Please execute the following commands in the mininet console (where mininet script is executed). The service (srvc1) is configured using SFC REST API. As part of the configuration the ingress and egress node connected the service is configured. Configuring switch and port information for the service functions. To provision the network for the two hosts (h1 and h5). Demonstrates the redirect action with service name srvc1. As we have applied action type redirect now ping should happen between hosts h1 and h5. The redirect functionality can be verified by the time taken by the ping operation (200ms). 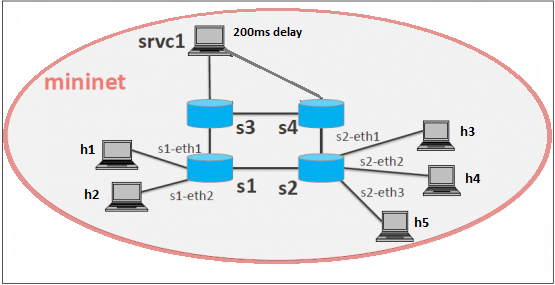 The service srvc1 configured using SFC introduces 200ms delay. As the traffic from h1 to h5 is redirected via the srvc1, the time taken by the traffic from h1 to h5 will take about 200ms. Flow entries added to nodes for the redirect action. This section explains how to provision QoS attribute mapping constraint using NIC OF-Renderer. The QoS attribute mapping currently supports DiffServ. It uses a 6-bit differentiated services code point (DSCP) in the 8-bit differentiated services field (DS field) in the IP header. Allow Permits the packet to be forwarded normally, but allows for packet header fields, e.g., DSCP, to be modified. Initially configure the QoS profile which contains profile name and DSCP value. When a packet is transferred from a source to destination, the flow builder evaluates whether the transferred packet matches the condition such as action, endpoints in the flow. If the packet matches the endpoints, the flow builder applies the flow matching action and DSCP value. Before execute the following steps, please, use the default requirements. See section Default Requirements. To apply the QoS constraint, configure the QoS profile. Valid DSCP value ranges from 0-63. To provision the network for the two hosts (h1 and h3), add intents that allows traffic in both directions by execute the following CLI command. Demonstrates the ALLOW action with constraint QoS and QoS profile name. As we have applied action type ALLOW now ping should happen between hosts h1 and h3. Verification of the flow entry and ensuring the mod_nw_tos is part of actions. This section demonstrates log action in OF Renderer. This demonstration aims at enabling communication between two hosts and logging the flow statistics details of the particular traffic. To log the flow statistics details of the particular traffic. To view the flow statistics log details such as, byte count, packet count and duration, check the karaf.log.